I Am A Star has had to call on all her courage as she fought out a head-bobbing finish to claim the Group Two Let's Elope Stakes at Flemington. After feet problems ruined an autumn campaign, I Am A Star returned to winning form by the narrowest possible margin at Flemington. 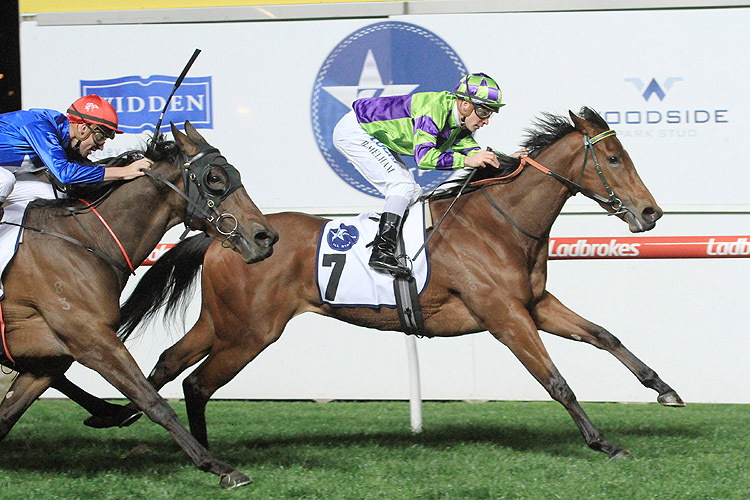 I Am A Star collected her fourth victory at the track when she won Saturday's Let's Elope Stakes. Trainer Shane Nichols has further black-type riches in mind for the mare in coming months culminating in the Myer Classic at Flemington, a race she won in 2016. Ridden by Ben Melham , I Am A Star ($10) outbobbed Bella Martini ($8.50) on the line to score by a nose with Sheezdashing ($19) running on from back in the field for third, three-quarters-of-a-length away. Nichols explained I Am A Star has shelly feet and developed a splint-bone injury that forced her to miss the autumn after a successful spring last year. He said owner Mathew Sandbloom had given the go ahead for a spring campaign although the mare could have been sent off to the breeding barn if her form didn't warrant racing on. "We were run-to-run in the first part of the prep because we had time," Nichols said. "If she had a run or two and she failed, we could still send her to stud." Nichols is planning returning to Moonee Valley for the Stocks Stakes, a race she won last year, on September 28 after which he'll make a decision on which way to head into the Myer Classic. "The only thing we need to think about is where we go after the Stocks Stakes into the Myer," Nichols said. "Do we run in the Toorak or do we wait and go straight into the Myer. "Ideally I would like to try her at a mile and a quarter (2000m) at the end of the Flemington carnival, but let's just go one step at a time."